Our Heritage - Henninger Funeral Home, Inc.
Old Hickory Jackson was still in the White House in 1825 and the war between the North and the South was still a generation away when Frederick Rapp Henninger decided to become an undertaker. He apprenticed himself to his uncle, Frederick Haberaker, who had established a cabinet and undertaking business. Records reveal that Frederick Haberaker's father served under General Washington at Valley Forge, PA making coffins for the Continental Army. Young Henninger was rewarded with a partnership in 1839, and the firm name was changed to Haberaker & Henninger. In 1850, after the death of Mr. Haberaker, Frederick purchased the shares of the business and moved the operation to South Seventh Street, the preferred business and residential thoroughfare at that time. As failing eyesight forced Frederick to retire, his brother Charles R. Henninger opened his own business in 1859 at 716 Penn St. As the Civil War engulfed the country and men were called to military service a third brother, John R. Henninger, owner of a shoe making business, entered the business to help Charles. John remained with Charles at 716 Penn St. until 1870, when he started his own business at 1015 Penn St. and later moving to 1025 Penn St. John's son Hunter Henninger was later taken into the business as a partner. Hunter took over the business interest in 1890 at the death of his father. At that time, Charles and Hunter conducted the major portion of funerals in Reading. Upon the death of Charles, Hunter bought the business from Charlie's son, Hiram Henninger, allowing him to serve all Henninger Patrons from the original 716 Penn St. location. In 1917, however, Hunter purchased the property on 229 North 5th St., the current location of the mortuary. The son of Hunter Henninger, J. Hunter Henninger represented the fourth generation of Henningers to enter the business after his father's death in 1925. J. Hunter Henninger rebuilt the mortuary in the 1940's to its current design. Following in family tradition and representing the fifth generation, J. 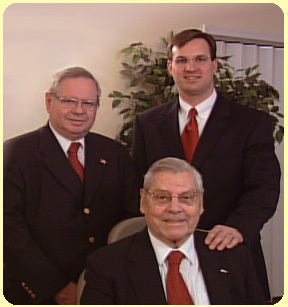 Hunter's son also entered the business after serving in World War II, John H. Henninger Jr. Later the sixth generation, his son, John H. Henninger, III and the Seventh generation, grandson, Robert Reilly Nye, current owner. 180 years of service is a great accomplishment which the firm is justly proud. It confers the dignity of age and faithful service. With the same conceptions and high ideals of the founder's still an inherent part of this organization, "Henninger Directed Funerals" have attained a place of Preeminence in Reading.